There are those that say it is possible to complete a triathlon without investing in the best womens triathlon suit. They would be right, it is possible to compete. But if you want to be one of the best or even stand a chance of beating your best time; you need the right gear. The Zoot Sports Women’s Ultra Tri Racesuit is full of excellent innovations that help you to keep going no matter how tough the course gets. It has a range of features that will help you to move smoothly, remain comfortable and dry faster. This offering from Zoot is easy to get in and out of thanks to its muscle vest style top and the front zipper. Of course it is figure hugging but it is surprisingly easy to slide on. Once you put this on the tri carbon chamois will envelope your body, allowing it to breathe and moisture to be channeled away from your body. It will stretch to fit your body without adding extra tension and the biowrap leg helm will help to ensure the suit stays exactly where it is supposed to; no matter which stage of the race you’re at. You may wish to wear a sports bra with the chest support but this is a matter of personal preference. It is worth noting that the chest support can be unzipped and removed if desired. Even the inseam has been doubled up to prevent any unnecessary chaffing and help create the most aerodynamic lines possible. The suit features coldblack, this material is designed to prevent sunlight being absorbed by the suit. This will prevent you from getting burnt by the sun while competing. It will also reduce the heat buildup in your body; helping you to run faster. When you’re running 26 miles, swimming two and a half and then still need to get through a twelve mile cycle ride you’re going to need an energy boost along the way. This suit has 4 hip holster pockets designed just for this purpose. Perhaps one of the greatest features of this tri suit is the fact that it can be used in open water or if you are training in the pool. Most suits will degrade if used in chlorinated water but this is not the case with this one. This makes it both distinctive and worthwhile at the same time. Several users have reported an issue with the leg hem cutting into their leg after the swim section. This is not an issue I noticed but it is worth mentioning before you purchase the Zoot Women’s Ultra. That’s it! There don’t seem to be any other disadvantages to this suit. This is a great alternative to the Zoot. The Pearl iZUMi Select Pursuitis a little cheaper than the Zoot but offers nearly all the same features and qualities. The Pearl iZUMi Select Pursuit uses their patented Select Transfer Dry material which can be considered the bench mark by which all other suits should be checked. It is incredibly quick at drying even if there is no direct sunshine. This will help to ensure you are comfortable on the next section and can improve your times. Your comfort will be enhanced by the 10 inch zipper and 8 inch inseam. These will help to prevent chaffing and ensure you have adequate ventilation no matter which stage of the race you’re at. The Lycra in the suit provides just the right amount of stretch to facilitate in your comfort. It will fit you like a second skin; helping you to be more aerodynamic and stay comfortable. The material is also designed to transfer the moisture away from your body and you’ll be happy to see an easy access pocket envelope for your high energy snacks. The theory behind this is that it will make it easier for you to compete in different climates depending on what is most comfortable for you. Of course, you’ll need to factor in the time it takes to get the separate bra on. However it may make the idea of a tri suit for the entire event a little less likely. The Pearl iZUMi Select Pursuit is made predominantly from nylon which breaks down quickly when you swim in a chlorinated pool. This means that this suit is not a viable option if you complete triathlons inside as opposed to the open water. Several women have reported that the separate bra is a little flimsy; it doesn’t give the support you need to comfortably complete the running section. This makes it necessary to carry a separate sports bra which is not convenient if you are a serious contender. It is also worth noting that the design of the suit is such that changing quickly is virtually impossible. The intent is there as a 10 inch zipper is supplied. Unfortunately the reality is that you’re likely to get stuck while changing and lose valuable time. This is a great option if you’re new to the sport or you have a limited budget. Despite being cheaper than the other two offerings this suit can still help you to achieve your best time yet. The short sleeves on the Orca Core have been specifically designed to maximize comfort and aerodynamics. They have been tested in a wind tunnel to ensure they stay in place. The research allowed Orca to decide the best possible length of the shirt sleeves to match the performance you’d like to give. This is an exceptionally comfortable tri suit. It is made predominantly from recycled Italian Lycra which gives the suit the perfect amount of stretch while being wear resistant. The elastic grips at the bottom of the legs will also help. The result is a suit that will fit you perfectly and will protect you from all the elements at each stage of the race. The material is also designed to pull the water away from your skin. In fact the Orca Enduro water repellant coating actually allows you to glide through the water; moving it aside without hindering your progress. You’ll find the pad a good balance between comfort on the bike and a hindrance on the run. If you’re concerned with the environment you’ll be pleased to note that the nylon which makes up 88% of this suit is actually 80% recycled; that’s got to make you feel like you’re doing your bit to save the world. This suit has short sleeves but they are longer than most of the competition. The longer sleeves will increase your resistance to the sun; preventing you from getting sunburn and helping you to move faster. Again this suit is made predominantly from nylon. This means that you can’t use it extensively in a swimming pool. The chlorine in the water will cause the nylon in the Orca tri suit to break down and disintegrate. That’s not the outcome you’ll be hoping for. The leg pieces use elastic to hold them in place; preventing your suit from riding upwards uncomfortably. This may seem a little extreme when you first start racing but holding the suit in place is important. However, elastic is not necessarily the best way to do this; you’ll find that your legs feel compressed. Just a few years ago you would have found the choice of women’s tri suits extremely limiting. Now there is a wealth of suits available. This can make it much harder to choose the right suit for your needs. Fortunately you don’t need to look any further. The best womens triathlon suit whether you’re a beginner or a professional is the Zoot Sports Women Ultra Tri Racesuit. It is worth visiting a store so that you can try the suit on and purchase the right size. In general it will be a size up from your normal fitting but it is best to verify this before you commit to a purchase. 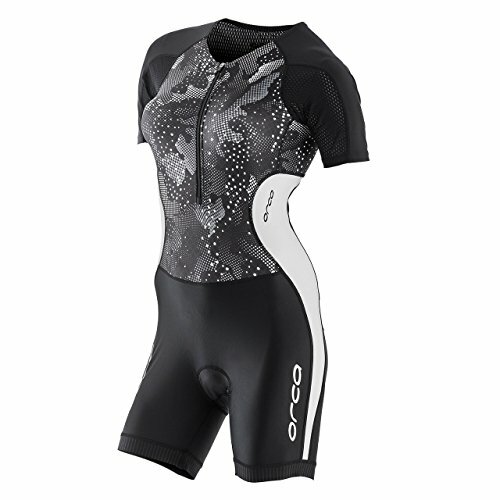 All of these are good options but there is no doubt that the Zoot Sports Women Ultra Tri racesuit has the edge. It will help you to improve your times and set your own personal best.